This proposal is so obnoxious I couldn’t believe it was real the first time I heard about it. 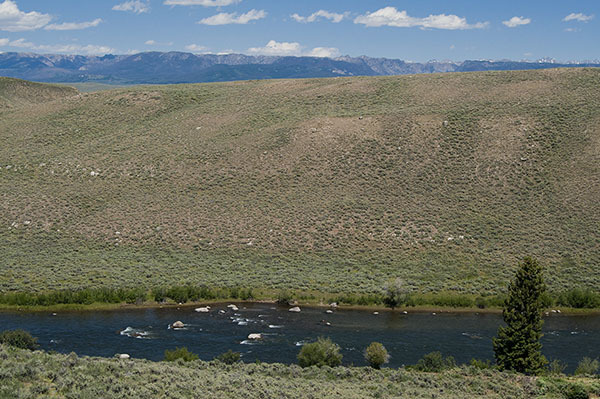 This is a world class fishing river and the reservoir would cut off the famed pronghorn migration route from the Red Desert to Grand Teton National Park that so many have worked on to keep open. Nov. 10. Commission against Green dam. State legislators will make final decision on $750,000 proposal in December. By Cory Hatch. Jackson Hole News and Guide. Recent background on this Nov. 4. Green River dam up for vote. By Angus M. Thuermer Jr. Jackson Hole Daily. I fish the Warren Bridge access occasionally. It’s 12-13 miles of wonderfully undeveloped trout and whitefish river. I first was in the Upper Green River country in the late 1980’s—my goodness how it’s been trashed with the boom. This dam would be icing on the cake—I don’t think I could bear going back. There are two organization that will fight it. One is Trout Unlimited and the other is American Rivers. Both have websites. It is unlikely that anyone will be allowed to dam a river. If they really need the storage, there is probably some off-stream location they could find where they could divert some of the high spring runoff via open channels and otherwise leave the river alone. And I think that downstream from Warren Bridge, legal access is not very much available. Am I right about that? No, Ralph that is not true. There are mutiple access points from Warren Bridge all the way to Fontenelle Res, and some are accessed via Private Land via Wyoming Access Yes program. Native is right. Actually Wyoming puts out a superb plastic map of the river from the Winds to Fontanelle that shows many access points for the whole stretch. Of course, it being Wyoming, you can’t actually anchor or wade when surrounded by private land. Instead you must just “float thru”. Thanks. That’s better than I thought. One can not drop anchor when they are floating through private land? I am glad that I live in Montana. When I was very young my dad and I went fly fishing and drifted down a section of the Big Horn river somewhere around the Wind River Canyon (too young to remember exactly where). I don’t think my dad was aware of that rule. Needless to say we found out…….Gotta love that “rights to the land underwater so keep your filthy anchor off of it”. There are several access areas downstream but not of the quality of Warren Bridge—a half mile here or a mile and a half there. None with the unbroken full stream (both sides) access of Warren Bridge. And the river is of a much different quality downstream of the bridge—flatter gradient—ranch land—Warren Bridge is 10 or 15 miles where the river transitions from a mountain stream to a prairie stream (not that there’s anything wrong with that–it just would be a tragedy to loose that section of river). I am glad this plan is tabled for now. A continuing water grab for the Green. This is a beautiful stretch of water above Warren Bridge and it would be shame for it to be covered in a crappy lake whose purpose is to serve irrigation and flood purposes for a few farmers along the river. this project will NOT NOT go thru. I observed Pronghorns gathering for their migration to the Red Desert here in Grand Teton National Park today. They were near the ridge north of the Gros Ventre River. It would be a tragedy if this herd were to cease to exist because of an un-needed dam. I have spent the past few days looking for wolves and moose and have been surrounded by hunters looking for elk to shoot. Most of them have been decent and law abiding, but this is certainly not a “fairchase” hunt by any definition. I wear orange everywhere I go. There are grizzlies out looking for gut piles, which makes every little hike an adventure. The Schwaubacker area along the Snake River has numerous fresh grizzly tracks every morning. I studied the area in Google Earth. There is a good off-stream storage site. In fact, there are a couple. I cannot see where the water storage is needed, however. The only areas that are not desert are the few steam bottoms that are irrigated pasture…or maybe alphalpha. The area is too high to grow crops. The Green already has two reservoirs on it. One is very large. If a little bit of pasture land is short on water some years…so what. Good grief, if a state government entity of any kind, commission or agency or whatever, in Wyoming says an idea is bad for the environment, it has just got to a bona fide real stinker. Truer words have never been blogged!! !